The ability to edit the group's name and description. View members in the group. Promote or demote members (from member to admin, or admin to member). Add new members to the group (if they have seats available). 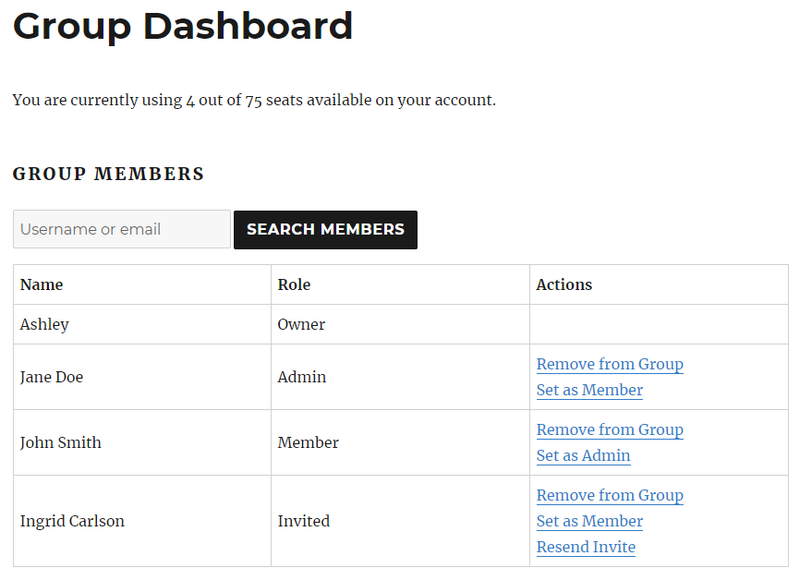 Remove members from the group (thus freeing up a seat). Re-send invitations to users who have been invited but have not yet accepted their invitation. All these actions are performed on the Group Dashboard page, which is the page containing the [rcp_group_dashboard] shortcode. Remove from Group - removes the member from the group, freeing up a seat. Set as Admin - promotes the member to the "admin" role. Set as Member - demotes an admin to the "member" role, or promotes an "invited" user to the "member" role (bypassing the normal invitation process). Resend Invite - resends the invitation email to a member that has not yet accepted. There is also a search field at the top of a page, which lets the owner quickly find a specific member by their username or email address. The username and password fields are both optional. If the username is left blank it will be set to the email address. If the password is left blank, it will be randomly generated. 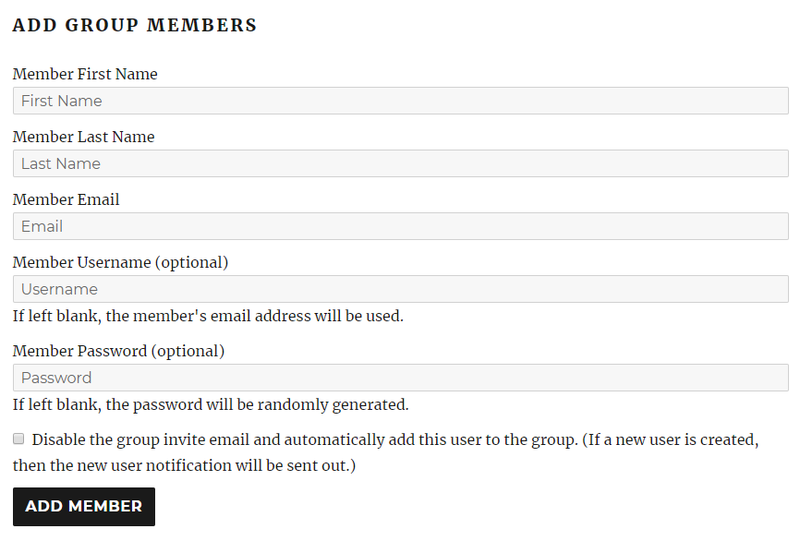 By default, adding a member will send the user an email inviting them to join the group (provided the group invite template is configured). There is a checkbox on the form allowing the owner to disable this invitation email and add the user straight to the group, without requiring that they accept the invitation via email. The user will receive an email notifying them of their new account and how to change/set their password. Another way for owners to add group members is by importing them from a CSV file. For more information about importing members and file formatting, see Importing Members from a CSV File. The final section on the dashboard allows the owner to edit the group name and description that they chose during registration.